This has been a fascinating project. 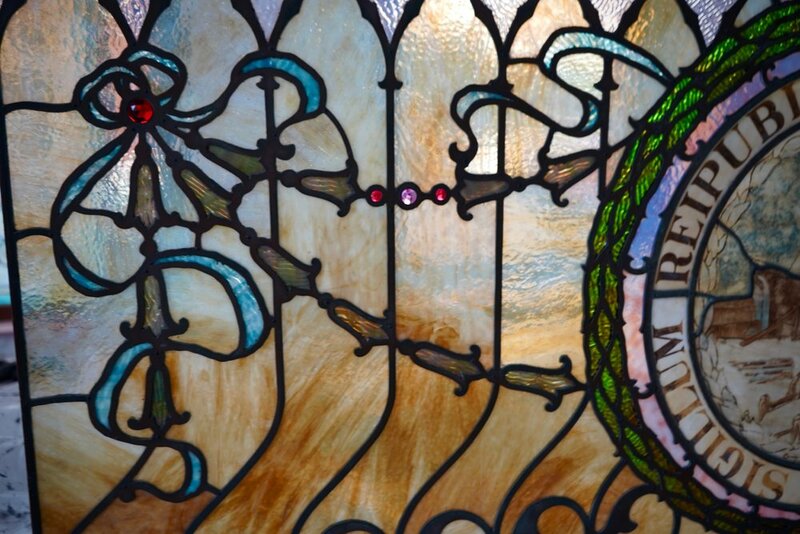 During our initial site visit, we assumed the panels were traditional leaded glass. Once we got them back to the studio, we realized they were unlike anything we’ve ever worked on. We determined that they were made using a decorative copper alloy that was riveted together. Upon further inspection, we found a thin brass matrix, separating the pieces of glass between the rivets. This kept the glass from cracking during the initial fabrication. During the documentation process, we discovered that the overlay was stamped with The Metallic Setting Co of Providence RI and a Patent Number 500,587 from April 1894. 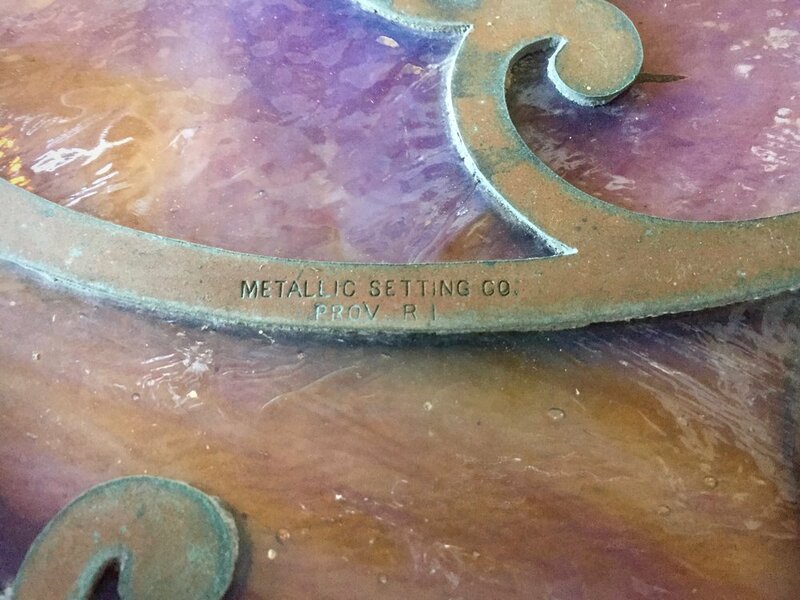 Working with the Providence Preservation Society, we found an article referencing The Metallic Setting Co and it’s founder, George B. Lee. 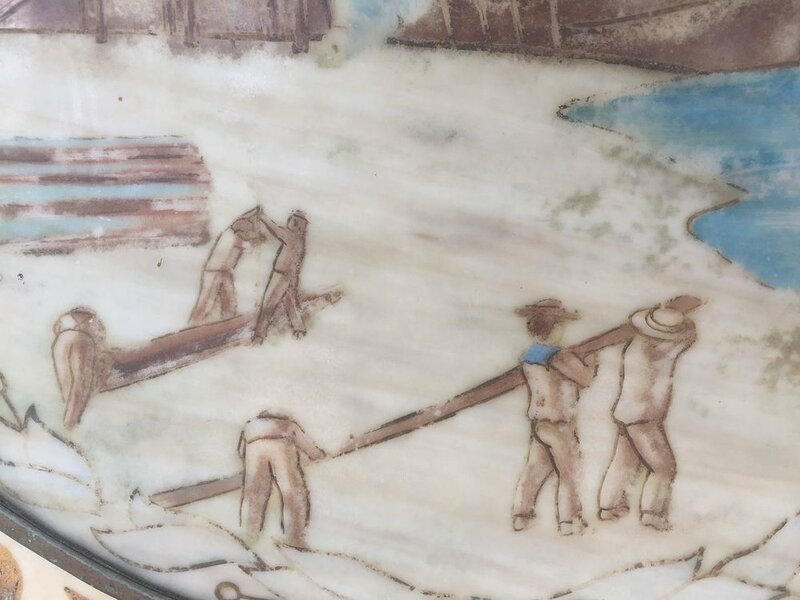 The article quoted him as wanting to re-establish “line and mass”, that he felt was missing from the decorative arts at that time. His unique approach bypasses the traditional methods of using varying thicknesses of lead cames or flanges. He invented an entirely new alloy to accomplish his vision. The article also referenced his other commissions, Abbey’s Theater on Broadway in NYC and Keith’s New Opera House in Boston. Tragically, both theaters have since been demolished. 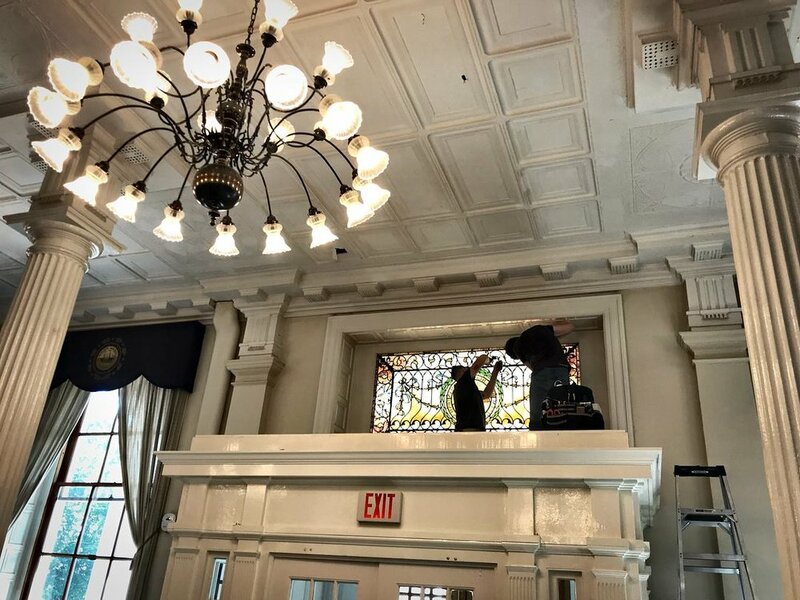 The Metallic Setting Company disappeared from the Providence directory by 1897, so the NH State House may be only window that has survived. With this knowledge in hand, we decided the best course of action was to leave much of the metal work intact. The cracked glass along the edge could be replaced by cutting the perimeter alloy. But any attempt to replace cracks in the interior of the panels would likely result in causing more damage. Additionally, the original glass selection was so purposeful, with individual pieces of glass selected from specific areas of the sheet. All the panels slowly transition from the darker perimeter glass to the light of the interior. It’s a beautiful effect. The original putty that acted as a weathertite seal between the alloy had become brittle and was falling out. The remaining putty was removed and new putty was applied to both the interior and exterior sides of the panels. Once cured, this process also strengthens the overall window, making individual pieces part of a collective whole. 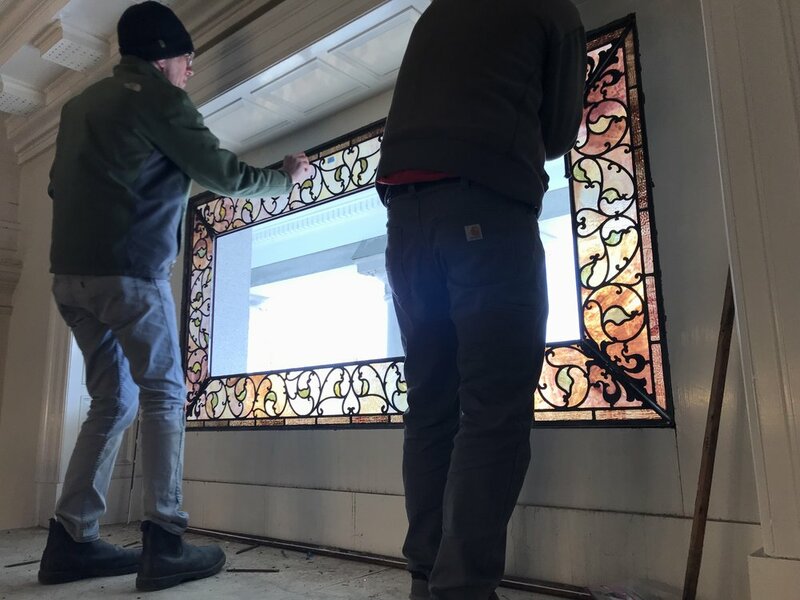 Now that the panels were restored, we turned our attention to the frame. 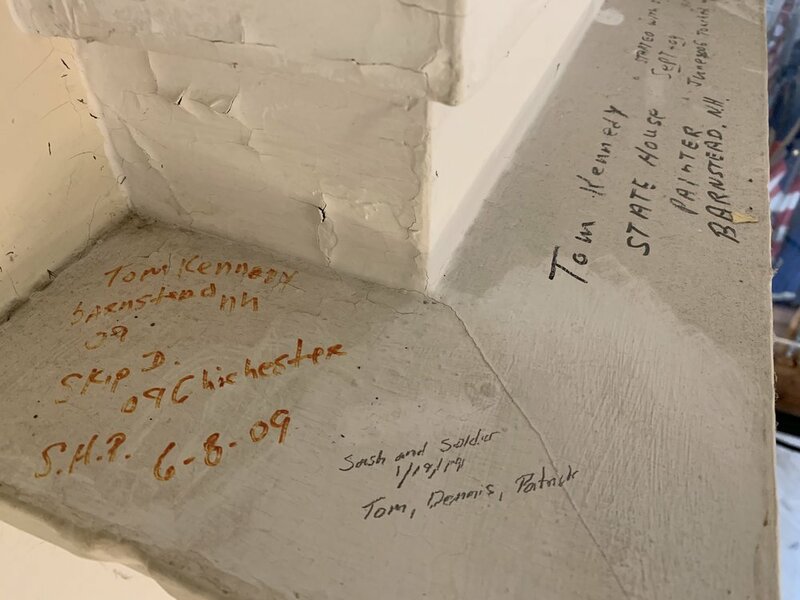 The original steel frame was installed into the jamb with only a few narrow stops holding it in place — there was no perimeter frame. This caused the frame to flex in windy conditions, weakening the joints. After being exposed to those conditions for the last 125 years or so, the structural integrity of frame had become weakened to the point of nearly falling apart. We engaged Sona Welding of Eliot, ME to fabricate a new stainless steel perimeter frame and weld it to the original. After a re-sizing, the panels fit perfectly. Upon installation, the frame was dramatically stiffer with much less play. 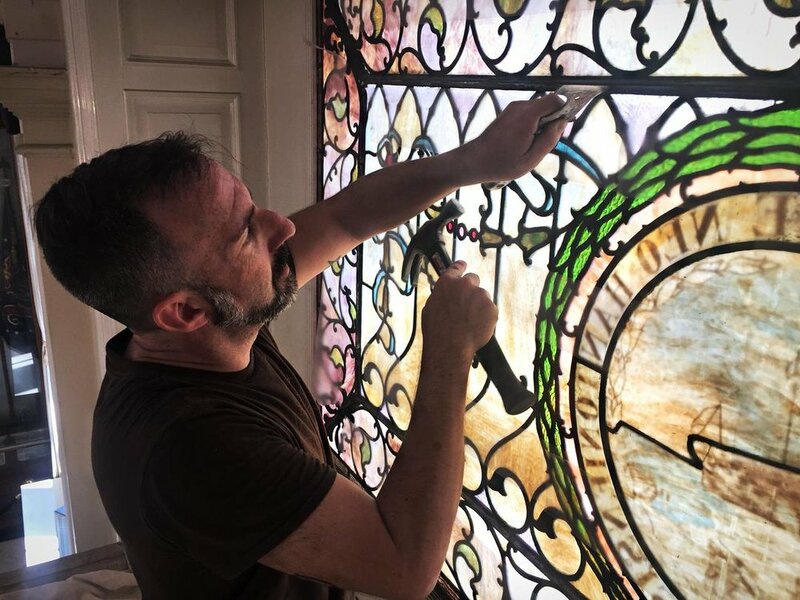 We these improvements, the Hall of Flags window likely won’t need another restoration for over 150 years. We were all thrilled to have been part of this project. 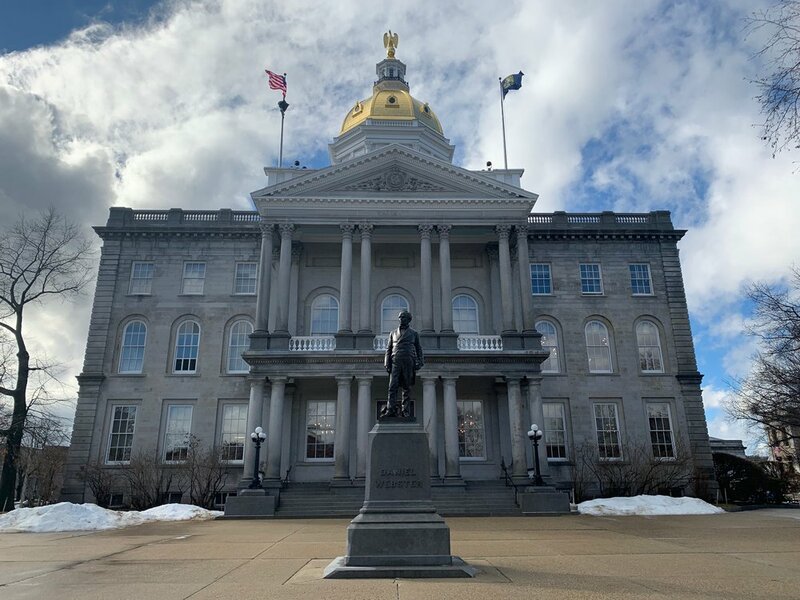 We know we are just a part of the continuum of craftsmen and women who have come before us, but it has truly been an honor to help uphold the original beauty of the NH State House. COMING SOON: A full rundown of a project we are excited about in the studio. 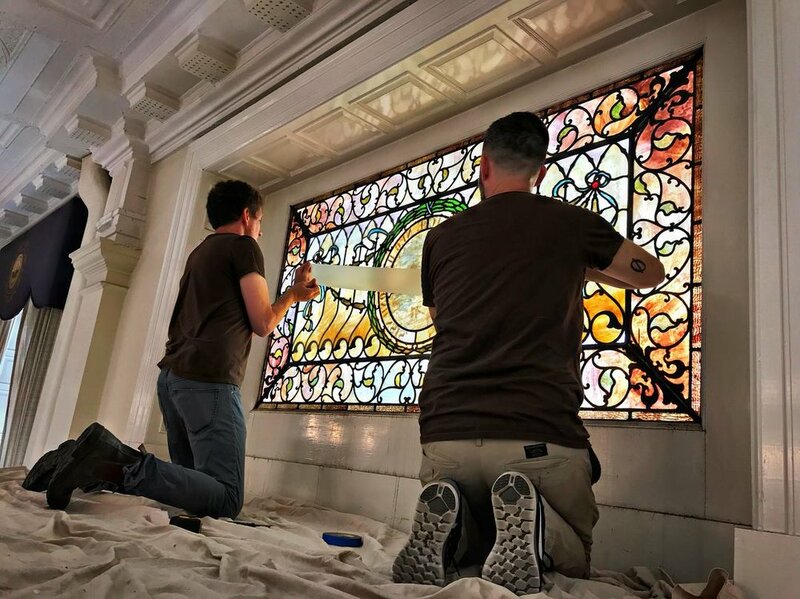 It’s the restoration of a historic window for the NH State House. 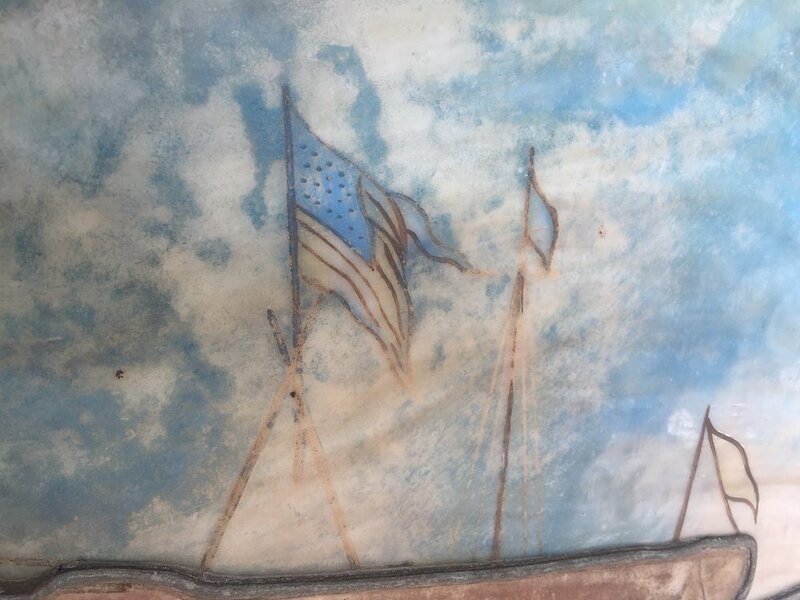 See below for removal pics of the beauty that welcomes visitors to the Hall of Flags.